New Quay West Wales Holiday Cottages. Hedd-y-Mor, Lewis Terrace, New Quay - sleeps 5 + Wi-Fi +pets x 2. 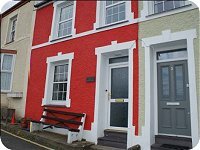 Hedd y Mor is a newly renovated traditional 3 bedroom house with Wi Fi, on Lewis Terrace, on the Ceredigion and All Wales Coastal Path Just a few minutes walk from the centre of New Quay and with superb views of Cardigan Bay and New Quay Harbour from the front windows. Pet friendly. Pay deposit by card online. Gerynant - near New Quay - sleeps 7 + Wi-Fi + pet friendly. This 3 bedroom pet-friendly Victorian Cottage offers a charming mix of the traditional and the modern with period furniture, central heating and Wi-Fi. Set in the tranquil hamlet of Nanternis with a wild garden and stream, it is just a few miles from New Quay. A delight for bird lovers and walkers. Off road parking. One well behaved pet is welcomed. Pay deposit by card online. June and July weeks available. This 3 bedroom centrally heated cottage is conveniently located in New Quay on a quiet street and is just a few minutes walk from the beaches, pubs, restaurants and shops. There are two double bedrooms - one with a king size bed. The third bedroom has full size bunk beds. Regret no pets. Pay deposit by card online. This is a newly renovated centrally heated 3 bedroom holiday home in New Quay West Wales and is just a few minutes from the seafront, the beaches, pier and the harbour. You can take a boat trip to watch Dolphins, learn how to paddleboard at the Water Sports Centre, buy fresh fish from a fishing boat or just sit on the beach all day. Regret no pets. . Pay deposit by credit / debit card online. 12 Park Street is a newly renovated and beautifully furnished family holiday house with private parking, four bedrooms sleeping up to eight, just a few minutes walk to all facilities. With two sitting rooms, large kitchen, family room, and fully enclosed terrace at the rear, this house is ideal for large or small groups. Discount prices for smaller groups. Pay deposit by card online. Ty Twt is the self-contained one bedroom annexe of the owner's farmhouse above New Quay, on the beautiful, unspoilt Cardigan Bay Heritage Coast, noted for its dolphins. It is about 10 minutes walk down the footpath into the town. One medium or 2 small well behaved dogs welcomed. Pay deposit online by card. Short breaks and summer weeks available. Cardigan Bay View is a double glazed centrally heated one bedroom holiday apartment with a view of Cardigan Bay from the front. 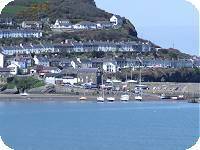 Just a couple of minutes walk from the beaches, pubs, shops and restaurants of New Quay. Regret no pets. Bed linen provided. Off road parking. Pay deposit online. This quirky three storey 1860s centrally heated house on Lewis Terrace has excellent views of the harbour and Cardigan Bay. There are 2 bedrooms, a double with sea and beach views plus a single. Fully enclosed garden with deck. Weekly rentals from Sunday to Sunday. Bed linen provided. Wi-Fi. Regret no pets. Pay deposit by card online. 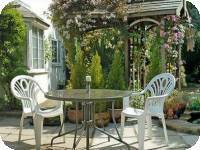 Spring Gardens, New Quay, sleeps 6 + Wi-Fi + cot. New online - summer and May half term available. Spring Gardens is a newly renovated 3 bedroom holiday home with private parking in New Quay West Wales just a one minute walk to the pier and beaches. You can take a boat trip to watch Dolphins, learn how to paddleboard at the Water Sports Centre, buy fresh fish from a fishing boat or just sit on the beach all day. Regret no pets. ‘Arwel’ offers a cosy three bedroom cottage, located within a short walking distance to the harbour, sandy beaches, local shops and restaurants in New Quay, whilst overlooking the village and Cardigan Bay. The close proximity to the beaches and the village are mirrored by the opportunity for coastal walks no more than five minutes from the front door. Regret no pets. 'Glan-y-Môr' Apartment, New Quay - sleeps 8 /10 + Wi-Fi - Friday start date. 1 Albion Terrace is a luxurious 3 bedroom cottage 2 minutes walk from the beach, pubs and restaurants. There are 2 bathrooms, 3 bedrooms, and an open plan living area together with landscaped back garden with patio and decking. Wi-Fi available. All bed linen and towels are provided. Pay deposit by card online. One small to medium dog welcomed in low season only. Short breaks available Mon.-Fri or Fri. to Monday. Driftwood is a newly renovated 5 bedroom, 4 bathroom family holiday house sleeping up to 9 and a baby, parking for 3 cars, short walk to Traethgwyn Beach, and walking distance or a short drive to New Quay. It has a large sitting room, spacious kitchen and dining room, and fully enclosed back garden. 2 cots and 2 high chairs, one well behaved dog welcomed. Weekly bookings from Sundays. This newly renovated character coastal cottage is one of a group of five on the hill above New Quay within 10 minutes walk from the beach, pubs and restaurants of the town. There are 3 bedrooms, a double a twin and a single and a patio and garden with distant sea views. There is private off road parking. Sunday to Sunday rentals. One medium or two small dogs welcomed. Delfryn is a large 4 Bedroom, 2 bathroom house with parking for 2 cars in the seaside town of New Quay, West Wales. Just a few minutes walk from the beaches, pubs and restaurants and is well equipped for a beach and family holiday. One well behaved medium dog welcome. Pay deposit by card online. Glangaran is a beautifully furnished centrally heated two bedroom ground floor apartment with private patio in the little coastal village of Cwmtydu just 2 minutes walk to the beach - Cwmtydu is just halfway between New Quay and Llangrannog. Bed linen provided. Regret no pets. Weekly bookings start Fridays, short breaks available. Less than 150 yards from Llanina's wide sandy beach, Y Bwthyn is the upper floor of a beautiful stone cottage in the grounds of the 17th century Llanina Mansion. The cottage provides everything you need for a relaxing holiday. Y Bwthyn is ideally located in a coastal setting, yet close to New Quay, only a mile and a half away. Traethgwyn and Cei Bach beaches are only a short walk away along a woodland riverside footpath. 1 double and 1 twin bedroom. One well behaved dog welcomed. Pay deposit by card online. Min-y-Graig (Edge of the Rocks) is on Rock Street in New Quay - directly overlooking the sea and with a sea front patio where you can sit and watch the Dolphins. The house has 2 bedrooms sleeping 3 or 4. There is a parking space at the front of the house on Rock Street. Regret no pets. Pay deposit by card online. 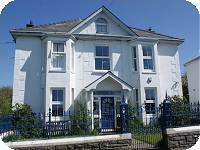 Close to the centre of Aberaeron, and with superb views from the garden, conservatory and first floor balcony across Aberaeron harbour and down to Cardigan Bay. There are 4 bedrooms sleeping up to 8 as well as a travel cot. Bed linen and towels are provided. Regret no pets. This stunning 4 Bedroom Victorian Sea Captain's house with all of its original decorative original features sits on the hill above New Quay, just a few minutes walk down to the town. Short breaks available low season - please call. Prices for 8 or up to 13. Pet friendly. This 3 bedroom Fisherman's Cottage is in a peaceful location on a quiet lane, yet is only a five minute walk down the hill into the centre of New Quay with its picturesque Harbour and Beaches, pubs and restaurants. Across the road from the cottage are woodlands. Off-road private parking for one car is directly opposite the front door. Sunday to Sunday rentals. Two well behaved dogs welcomed. Soar Cottage, New Quay- sleeps 2 - Limited Wi-Fi available. Tresaith Cottage is a centrally heated holiday home only a short walk from the very beautiful Tresaith Beach. The cottage sleeps up to 5 with two spacious bedrooms upstairs, and an enormous lounge, new kitchen and bathroom. Rentals start on Fridays,10% discount low season. 2 well behaved dogs welcomed. A four bedroom seaside house for 8, close to restaurants and pubs in New Quay and a few minutes walk to the beaches. Central heating and under-floor heating, two cots and high chairs, a sitting room upstairs and downstairs, 3 shower rooms plus a bathroom, a perfect location for celebrations and families sharing. Regret no pets. Sunday to Sunday rentals. Pay deposit by card online. Louvain is in the centre of New Quay is a large four bedroom newly renovated seaside house. In a prime location with the sea just a few steps from the door, this house offers superb family holiday home with off road parking for 2 cars. At the rear is a fully enclosed sun deck and patio. One small to medium well behaved dog welcome. 'Ty Canol' is newly renovated and located in a small Holiday Cottage complex set in 4 acres of grounds and perched high on the hill above New Quay with wonderful views from the gardens down to the Harbour and a five minute drive down the hill into New Quay. Ty Canol has 3 bedrooms sleeping up to 6 plus a baby. Bed linen is provided, travel cot provided. Parking for 2 cars. Pool option available. One medium or two small well-behaved pets welcome. You can pay the £50 deposit online. 'Ty Paer' is on a Grade II listed farm of 200 acres, dating from the 16th Century and has been farmed by members of the present family for many generations. The buildings retain the look of the original farm and are grouped around a large courtyard of whitewashed barns. With one double bedroom and a pull out sofa bed , the Cottage is just a few minutes drive from New Quay and the beaches. Short breaks available from £50 per night, 3 night minimum. Rhandir is in a superb location just a two or three minute walk from New Quay harbour and the beaches, shops and restaurants. This centrally heated and spacious ground floor apartment sleeps 4 with one double bedroom and one twin bedroom. There is a spacious back garden with furniture and off road parking. Regret no pets. Weeks and short breaks available at £70 per night, 2 night minimum. Just a few miles inland from the charming coastal town of Aberaeron in the small community of Ciliau Aeron, The Old Workshop is a newly extended and refurbished studio/annexe apartment with separate kitchen / diner and shower room. Fibre Wi-Fi . Summer weeks at £395. Short breaks at £70 p/night - 2 night min.. Off road parking. Regret no pets. Pay deposit online. Anrhegfan, New Quay - sleeps 5/6 + Wi-Fi + Pool/Sauna + Pet Friendly x 2. Anrhegfan is in a small Holiday Cottage complex set in 4 acres of grounds and perched high on the hill above New Quay. A good footpath leads from the cottage grounds down into New Quay - about a 10 minute walk. The cottage has 3 bedrooms, a double, a twin and a single. Bed linen provided. Pay deposit online by card. Now with optional onsite pool. Booking now for 2019. The Eco-House - sleeps 4 - 6 + Hot Tub & Wi-Fi. This brand new ‘super eco‘ house is perched quite dramatically above a stream just 2 miles from New Quay and half a mile from Cei Bach Beach. It offers a relaxing retreat from the bustle of New Quay yet is in walking distance (by beach when the tide is out, or by road) or a short car ride (approx 5 minutes) or bus journey away. The Wales Coastal Path is a short walk from the house. Weekly rentals Sun. to Sun. Regret no pets. Pay deposit by credit / debit card online. Brynonnen is a spacious traditional 4 bedroom farmhouse situated in a leafy lane in the hamlet of Nanternis, close to New Quay, famous for its bottle nose dolphins. The property is situated very close to the Ceredigion Heritage coastline and has distant sea views. If you enjoy walking then Brynonnen is an ideal base .Two well behaved dogs welcomed. Pay deposit online by card. Prices from £295 to £450 per week. Click the photo for information about the beaches of Cardigan Bay from Poppit Sands near Cardigan to Aberystwyth in the north. Would you rather rent a Caravan instead? We have a wide selection of holiday caravans in and around New Quay - mostly at the Quay West Holiday Park, and a few on local farms. Most are double glazed and centrally heated and all have off road parking. Browse 'All caravans' and 'pet friendly caravans'.